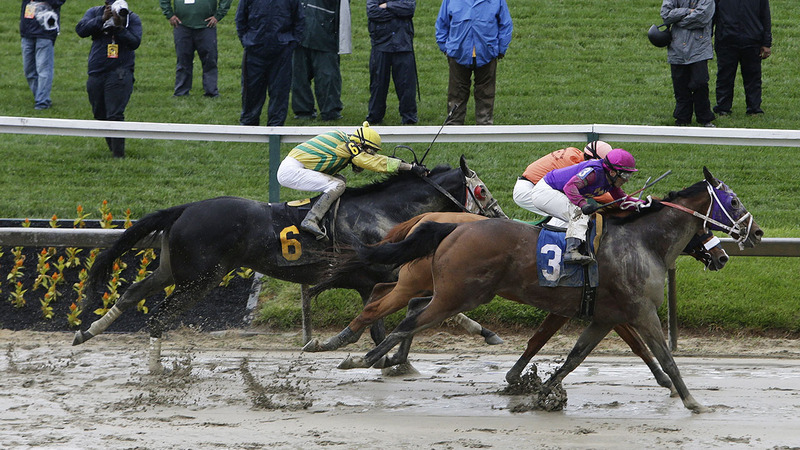 BALTIMORE, MD -- In a tragic start to Preakness day, two horses died after racing at Pimlico Race Course in Baltimore. Homeboykris had rallied to win the day's first race by a half-length on a rainy Saturday. After having his picture taken in the winner's circle, he collapsed and died on his walk back to the barn. Track officials believe the 9-year-old gelding suffered cardiovascular collapse. Pramedya was euthanized on the track after breaking her left front leg during the fourth race of the day, Pimlico racing officials said. She broke down around the turn and tumbled to the ground as jockey Daniel Centeno was thrown to the turf. Centeno was driven off in an ambulance. Officials said he broke his right collarbone. Pramedya was owned by Lael Stables, which also owned Kentucky Derby winner Barbaro, who broke his leg during the 2006 Preakness Stakes. The injury ultimately led to Barbaro's death eight months later. Homeboykris won the Champagne Stakes in 2009 and a year later finished 16th in the Kentucky Derby. Joe Torre, then the manager of the Los Angeles Dodgers, was a co-owner at the time. Homeboykris had just won his 14th race in 63 career starts and fourth in six races. The horse will be taken to New Bolton Center in Pennsylvania for an autopsy. ESPN senior writer Dana O'Neil and The Associated Press contributed to this report.